Paramahansa Yogananda is one of the greatest spiritual figures of the twentieth century, and also was one of the first Spiritual Mastersto bring the Yoga of the East to the aspiring West. Yogananda means “Bliss” through yoga (divine union with God) The title “Paramahansa” was given by his Guru Sri Yukteswar. Paramahansa means literally “Supreme Swan”. It is given to Swami’s who have established constant communion with God. At the age of 17 Yogananda became a disciple of Swami Sri Yukteswar who expertly guided him along the spiritual path. Sri Yukteswar was a direct disciple of Lahiri MahasayaLahiri Mahasaya is credited with reintroducing the ancient art of Kriya yoga into modern society. 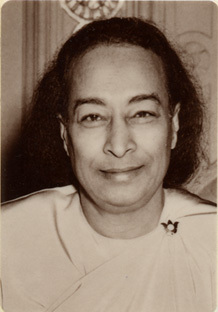 After several years of strict spiritual training in his Masters hermitage, Yogananda was inspired to travel to America. With the blessings of his Guru Sri Yukteswar, Yogananda travelled to the West, in order to share the spiritual traditions of India and his own inner realisations.